Photos by Richard Calmes; Courtesy of Dance Canvas, Inc.
A two-hander, the pair of performers tumble through, over and behind their set which is an aerial-acrobatic realm of possibility: they literally use each other to climb and escalate through their playground of infinite opportunities. Fortunately the visuals and story gel quite well so that neither looks displaced against the other. There are echoes of Alice in Wonderland, but only occasionally. This is a fantastic show; humourus, witty, clever, enchanting and captivating. A dark acrobatic fairy tale, “LoopsEnd”, swirling and spinning its way through the weekend at The Old Ironworks, is the first must-see event of The Fringe Fest that I witnessed. A chain and silk aerial show that springs from the Atlanta based Paper Doll Militia troupe, “LoopsEnd” comes off like the love child of Tim Burton and Trent Reznor: Shakespearean faeries run amok in the mind of Oyster Boy. Obsessed with both beauty and pain, the evening mixes high romanticism with steampunk sensibilities and is a natural fit for the space it inhabits. 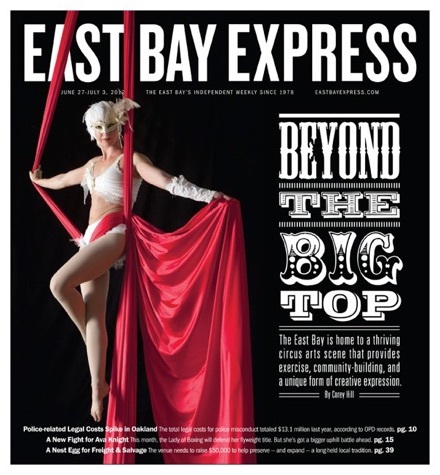 After an intense opening duet involving two female aerialists reversing roles as a captor and a jailer, a company of five women and one stilt-walking man swing and twist themselves into a series of poses worthy of a compositional painting. The company works in wonderful syncopation throughout a world of ropes and pulleys. They give focus rather than steal it and, because of this, achieve an artistic triumph where all share in the success. With romantic industrial underscoring, the troupe’s work causes angels to achieve lift, damsels to flee distress, and night flowers to bloom. It’s a midwinter night’s dream from which you will not want to awake. There is always at least one show destined to make a killing at Fringe — one show that ends up a sold-out blockbuster during the festival’s final days — and while it may be too early to say so, LoopsEnd may be that show. How appropriate for a venue called the Ironwork to incorporate iron chains and heavy industrial music within a surprisingly delicate and mesmerizing show.3 LoopsEnd takes risks, using a blend of hard chains with the usual flowing ribbons of cloth, and adding a dark sense of magic to the fairyesque art form. More impressively, the momentum of the show never diminished when the acrobats touched ground. Rather they seemed propelled with story, pushing and recharging themselves against one another, and your eye always dances with the characters. If one person stops, another quickly jumps in, all the choreography so perfectly effortless that every sleight of hand is overlooked, unless you happen to have unnaturally good peripheral vision. Dramatic technical skills were certainly on display in Friday night’s performance in the aerial duet“Unhinged”, one of the night’s standout pieces. As choreographing and performing duo Paper Doll Militia twisted themselves through a swath of silky white fabric, audible gasps and murmurs rippled through the theater. 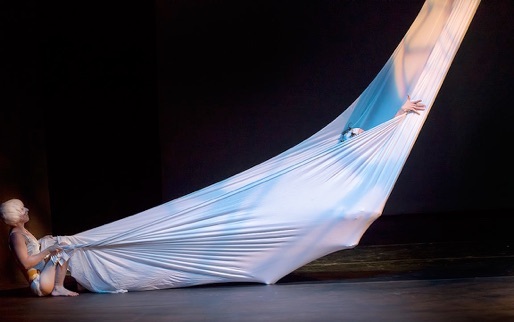 But unlike many aerial performers, collaborators Rain Anya and Sarah Bebe Holmes didn’t just use the silk as a tool to move from one acrobatic pose to another. The dancers, clad in bizarrely tattered, Miley Cyrus-esque costumes, constantly moved through and with the fabric; they used it to alternately hide and reveal their contorted forms, like three otherworldly creatures playing in a secret kingdom. One coolly lit white silk, an oppressive soundtrack and two manic sylph siblings: the simplest of ingredients converge here to convey an icy mystical hinterland in this gem of aerial theatre. It’s like the narcissus myth turned askew; the conundrum is whether to fight, play or embrace when the mirroring partner can’t quite be trusted. The silks become both the protagonists’ playground and battlefield, and are used with lively and inventive panache. Stock aerial moves have their place, but the characterisation that saturates the movement drives the compelling performance. These sprightly nymphs are cheeky, strong and not quite of this world. If they decide to inelegantly clamber up the widely spread material, they inspire awe at the gleeful fun they have with scant resources. They are unhinged, after all.